For repair, replacement, or restoration, there is no substitute for OEM parts. 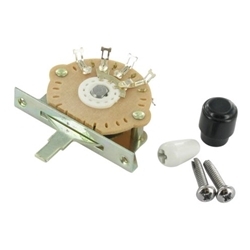 This is a genuine 3-position Vintage Pickup Selector Switch for use with American Vintage, American Standard, American Special, Standard, Deluxe, and Classic series Telecaster and Stratocaster electric guitars. It includes one white switch tip for a Stratocaster and one black switch tip for a Telecaster. Take it from Sweetwater Fender players: for a vintage look and historically reliable performance, genuine Fender parts are the way to go.